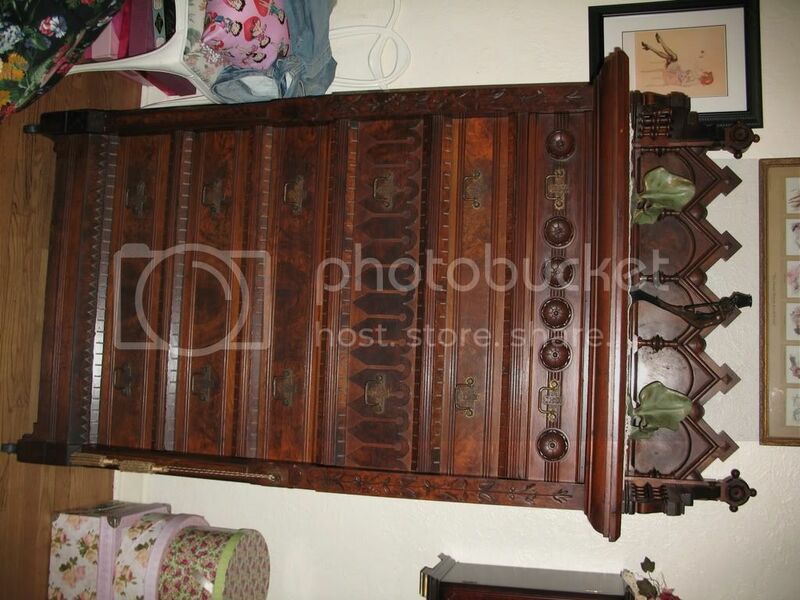 The darkened pictures on this listing belie the quality of this very large Modern Gothic dresser. I doctored up this picture (lightened it) so as to give you a better grasp of the quality of this piece. Clicking on the image above will provide a larger image with greater detail. Clicking on the image again will allow you to zoom in and out further. This one is a beauty and the seller states that it is so massive that it takes 4 men to carry the mirror alone. Once again, I am saddened, however to find that the massive matching bed was separated and sold previously for $8,000, so we are stuck with a one-off piece forever separated from it’s brethren. Sorry to get anthropomorphic on you, but separation of matching pieces is one of my pet peeves. The current price of $999, I believe, is a fair price for a piece of this magnitude and quality. If can think of a spot for it, I may even throw my hat in the ring. Bidding ends tomorrow and more images and details can be found at the listing. That dresser is beautiful! Go for it! If we had more room in our bedroom it would go perfect with our other dressers. I think this modern gothic stuff is only beginning to be understood and appreciated. Buy it now while still reasonably priced. I feel the same way about seperating matching pieces!!!! They were born and raised together!!!!! But People get more money seperating them! The Dresser is truly sublime! Good Luck! This piece is rare and Victorian, but not Gothic, modern, revival or ancient. It just does not have enough gothicity. Modern Gothic, American, should have quatrefoils (often pierced), metalwork in the form of tracery (as on Kimbel pieces.) The roundels and the suggestion of battlements are slightly Gothic, but the half-rounds are more Romanesque. Overall, I would guess that very few gothicists would choose this piece for their collections, much less a museum as an example of Modern Gothic. Modern Gothic is, in any case, a small moment in American Victorian applied arts, and there are even fewer collectors than there are of the Gothic Revival (c.1820-1860) itself. If there are any collectors of Modern Gothic on this list, I would like to meet them. Ok I stand corrected, perhaps it would have been more correct to refer to the dresser as being in the Aesthetic taste but the two terms are often used interchangeably. Would you say my lockside is modern gothic? Yes, Zeke, your piece is Modern Gothic. There have been two or three examples at auction in recent years. I like it, as it is interesting and useful. Purist Gothic Revival people would not have it, but my interests are broader, including American, English, French, and other European. Someone with enough discipline and effort could form an interesting collection of Modern Gothic, and if they included some of post-Pugin English furniture, it might rise to a very high level. The question becomes definition, because Modern Gothic quickly evolves into Arts & Crafts. It has been suggested by scholars that Pugin and Morris were competitors, long after Pugin’s death in 1852. The field of 19th century applied arts is still developing, still wanting more serious study.